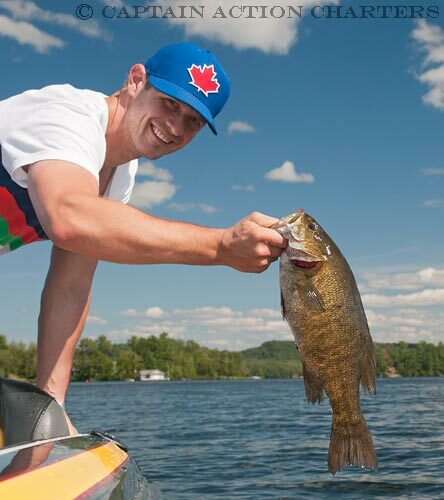 guests the finest fishing trips available to anglers looking for a premiere Muskoka lakes fishing charter. Three decades of guiding in the Muskoka region has made this native Muskoka guide the most sought after angler in the Muskoka region. 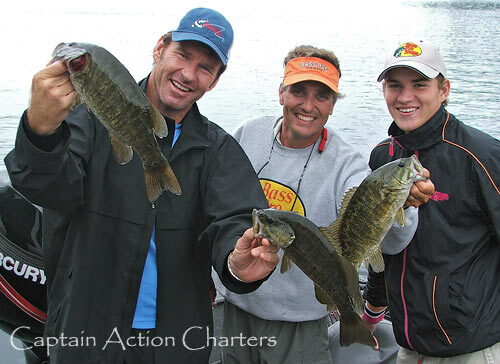 Captain Action Charters guide service is based out of the Muskoka lakes area allowing easy access to Lake Rousseau, Lake Joseph, Lake Muskoka, Lake of Bays and the Huntsville chain of lakes; not to mention several small isolated lakes that offer excellent fishing. Captain Mike Bertelsen provides his clients with the finest Bass Pro Shops tackle available. Whatever species you choose to pursue, our proven locations and techniques will ensure a productive and enjoyable fishing experience. This combined with helpful tips will assist you to become a more successful angler. Comfort and Safety: Relax on a large 21 foot Nitro fishing boat with a 250 hp Mercury that is fully equipped with the latest in fishing technology. Muskoka Region's only full time guide, Captain Mike spends over 200 days a year on the water, allowing him to closely track the fish as the water temperatures change and baitfish move. This guarantees his clients the best success possible. Over 20 wins and top 5 finishes in Bass & Pike tournaments. Captain Mike offers 4 and 7 hour trips. Our boats can handle 3 anglers. We can accommodate larger groups if needed. All rods, reels and lures supplied at no additional cost. Call 705-789-3126 or email us to request price information.